When I saw that the Women’s Library in Whitechapel were putting on an exhibition about the role of bikes in women’s liberation I thought – at last! Cycling played a massive part in my personal liberation and realisation of the power of my body. This machine gave me gave me freedom and my experiences as a female cyclist were a fundamental part of my politicisation and to this day form the basis of much of my activism. Many women around me have similar stories. So it stands to reason (in my mind) that they played a role in the movement for equality for women in general but there has actually been very little research on this – and I’m talking as someone whose been looking. 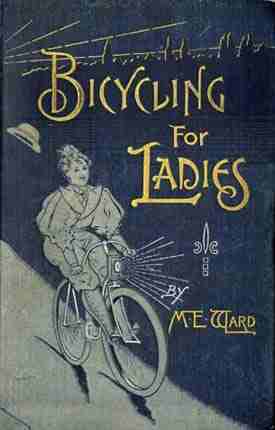 There’s plenty of books on the history of bikes which make some reference to women’s cycling and even some on the role of cycling in creating wider social change but had found nothing specifically about how they have helped change the role of women in society, until now. The historian responsible for this project is Sheila Hanlon and last Friday night she gave a talk all about it to a packed out lecture theatre at the Women’s Library. The crowd felt like a real cycling sisterhood with people I knew or recognised from plenty of bike/ activist projects and even the grandson of a cycling suffragette. Sheila gave us a fascinating insight into how the suffrage movement used the bike as an organising and protest tool in its own right: from forming ‘bike brigades’ who cycled to country towns and villages recruiting new members, to blockading politicians cars, using old bike parts as fake bombs, organising cycling parades and even a nationwide pilgrimage involving bikes (not unlike the ‘caravans’ used in environmental campaigning today). Unsurprisingly, loads of prominent women’s right activists, such as the Pankhurst’s, were avid cyclists. But while the development of men’s cycling as mode of transport and leisure pursuit went without much public comment and certainly no moral outcry the same was not true for women. 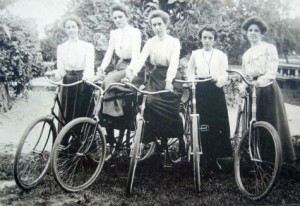 From the very begining, the acceptability of women riding bikes was an issue of public debate. This intensified in the Victorian and Edwardian era’s when the bike came to symbolise the ‘new women’: independent, mobile, confident and therefore dangerous to the social order of things. So much so, that the organisers of an anti-Suffrage rally in Cambridge burnt an effigy of a women on a bike. This goes to show it was not just that bikes were practically useful for campiagning for women’s rights but also that the very fact of riding a bike gave women such new power that it frightened the patriarchal order. Women are still a small percentage of the cycling population and more prone to accident and injury on the road than men but rather than blame this on negative assumptions of feminine behaviours like timidity and passivity ‘Cycling to Suffrage’highlights the historical nature of the social prejudice which has contributed to our secondary position on the road. It was brilliant that London Bike Kitchen’s Women and Gender variant (W.a.G) night and Breeze women’s network got a shout out at the end as examples of projects which have taken up the baton for the next generation of women cyclists (of course I’d like to add Spokeswomen and Beryls’ Night to that list!) building the skills, confidence and acceptance of women on the road. I left with a sense of connectedness to all the pioneers of women’s cycling and Suffrage campaigners who have got us this far and reminded that every women on a bike is a trail blazer. PreviousFreewheelers Bicycle Workshop – A co-op run by women!